This is a big award-winning film. Tom Hanks’s first Oscar. Apparently he liked drama so much only Pixar can get him to come back to comedy anymore. This feels like one of those safe messages that Hollywood likes to play with to net awards, but a lot has changed since 1993. The stance was more controversial at the time. Well, it’s still controversial, but the prevailing opinion is now more aligned with the film. I can’t really speak to how it was received because I was five years old at the time. So much as I’m ever excited, I’m looking forward to starting something fun next week. Andy Beckett is a young, brilliant lawyer who happens to be homosexual and have AIDS, two facts he keeps hidden at work because it’s the early 90s. An important document he was in charge of goes missing at the office, and he’s fired for incompetence, though he believes it was actually because the senior partners noticed his lesions and deduced he was gay and infected. 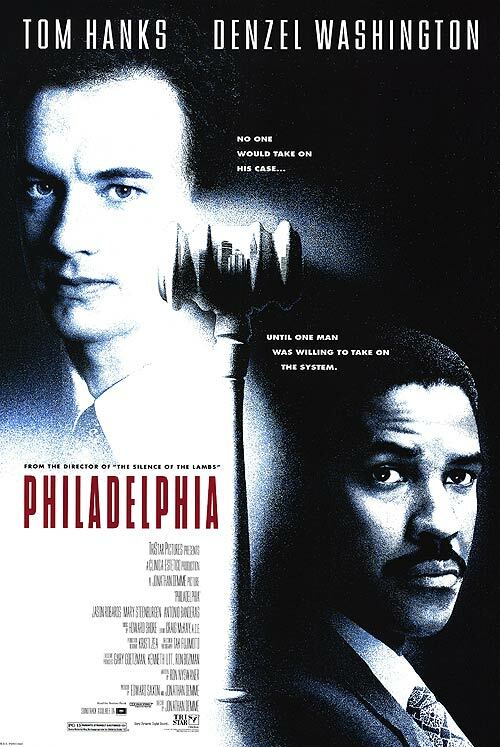 In searching for a lawyer who will take his wrongful termination suit, he approaches Joe Miller, who at first is personally prejudiced against Andy as a gay man, but eventually decides to try to overcome his feelings for justice. As Andy’s health declines, the court proceedings cause them both stress and embarrassment. Hanks may deserve the bigger accolades for his performance due to his ability to play the late health effects of AIDS, but I really felt this was Denzel Washington’s story. Andy’s had the entire mess thrown at him without any means of escape, so he can’t do anything other than keep going. Miller, as Andy’s legal council, volunteered for all of his strife, and has ways to get out of it. He has to handle his prejudices inside the courtroom and out in the real world. He has to argue for tolerance while still being disgusted by a man trying to chat him up. If I taught a film class, I would show this movie as an example of visual storytelling, because it’s exaggerated to the point it already feels like a classroom demonstration. There are dozens of shots where the camera and occasionally the staging are used to evoke emotion. The director especially likes to use extra-jittery handheld camera shots to force the audience to feel uncomfortable in quiet scenes. Often subjects are in soft focus with short lenses to make them seem disorientingly large, close, and blurry. Extreme camera tilts and heights are also strongly in play, and the staging of the scene where Andy gets fired, with him set alone at one end of the room and the senior partners a uniform block at the other, is jarringly symbolic compared to the rest of the movie. I know these psychological techniques, so when I say recognizing them takes me out of the movie, it doesn’t carry the same weight as the average audience member, but I hope at least some of them are blatant enough to distract anybody. There are several notable names in small roles. I consider Antonio Banderas as Andy’s boyfriend Miguel to be a small role, because he didn’t have much impact on the plot and was mostly there as an accessory to demonstrate Andy’s stability. I’ve seen Jason Robards, one of the senior partners, in a lot of things, as well as Daniel von Bargen, who is probably best known for the chief antagonist in O Brother Where Art Thou, as the foreman of the jury. Mary Steenburgen is the council for the defense, who seems mostly satisfied or even pleased with her task of cutting down Andy’s case until she cross-examines him and has a moment where she seems to indicate to her assistant that she’s disgusting herself. When I went into this movie, I was prejudiced against it as an Oscar bait film, but in watching it, I got involved, I got to know it, and I was moved by it. Sure, I rolled my eyes at some overly-artistic moments, but the story had heart and was sincerely presented. That’s something I would have missed if I hadn’t looked past my preconceptions. Watch this movie: with an open mind and critical eye. Don’t watch this movie: confused about the difference between stereotypes and realism. This movie captured the AIDS paranoia better than any other. I note that Philidelphia feels more like an indie film than the oscar bait it ended up inspiring.